Mobile police surgeries are to be held in Barnt Green and Cofton Hackett to increase community engagement in those villages. 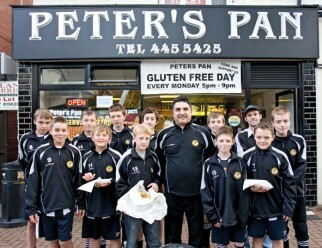 Youngsters from Alvechurch Lions Football Club show off their new kit, which has been sponsored by Peter’s Pan fish and chip shop in Barnt Green. The Queen’s Head Inn at Stoke Pound, Bromsgrove, is claiming a new world record for the largest chocolate truffle. The MUGA is to stay where it is in Alvechurch if the recommendations of Bromsgrove’s Joint Overview and Scrutiny Board are accepted by the ruling Cabinet. Do you want to be part of Redditch? A large part of The Village area could find itself linked politically to Redditch if election boundary proposals are adopted. John Foster tells us about the latest developments at Alvechurch FC. Plans for a wind turbine on the Lickey Hills have been rejected by Bromsgrove District Council. The new “Welcome to Blackwell” sign at the bottom of Greenhill on the village border with Burcot has, it seems, gone for good. The Stroke Survivors in Bromsgrove & Redditch group says goodbye to Sandra Langford as she retires after nearly 15 years as communication support co-ordinator for The Stroke Association. Police are appealing for witnesses and information after a trailer and wood splitter were stolen from Lickey Hills Country Park last weekend. Mayfield Farm is close to clearing the last official hurdle to starting a factory in Hopwood rendering up to 105 tonnes of animal parts each day. The location of the new youth club, The Lounge, in Alvechurch has been revealed. Happy birthday, Blackwell & Burcot WI! Blackwell & Burcot WI celebrated its 80th birthday in style with by turning its monthly meeting into a party at Barnt Green Cricket Club pavilion, writes Janet King. A 14-year-old boy on his way to catch the school bus in Alvechurch was kicked and punched in a village alley and had to be treated in hospital. Thieves have driven off with a trailer and lawnmower worth £3,000 from an Alvechurch barn.